I.B.Tauris is delighted to announce the reissue in paperback in three volumes of the definitive, most comprehensive edition, in the finest translations and fully annotated, of the writings of this great filmmaker, theorist and teacher of film - and one of the most original aesthetic thinkers of the twentieth century. Volume 3 follows on from the 1922-34 writings of Volume 1 and parallels Volume 2's essays on the theory of montage. 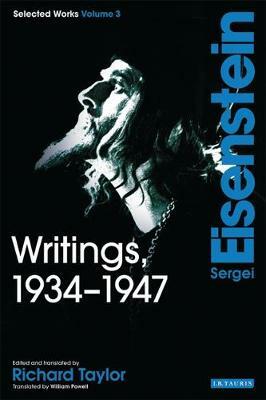 In the period covered by this volume, Eisenstein's film-making ran into the difficulties generated by the Soviet authorities' increasingly restrictive definition of Socialist Realism, by the show trials and the purges, the Second World War, and the post-war proclamation of rigid cultural orthodoxy by Stalin's henchman, Zhdanov. Here we experience Eisenstein's reaction to this hostile environment, as filmmaker, theorist and teacher, from his public obeisance over 'Bezhin Meadow' to his private defiance with 'Ivan the Terrible'.